One of the many reasons that I love green garlic and green alliums generally is that they are among the earliest things to come out of the garden, assuming that you planted in early fall. I have plenty of summer veggies in my freezer, but as the days start to lengthen I get ravenously keen for the first real, fresh greens, and by mid-February I’m eating out of the garden again. For early green alliums, plant some in a block that you can cover with Agribon or other frost blanket material. I like to put a short row of my regular yellow storage onions in this block in September, and each will divide and make four or five superbly sweet green onions in early spring. Garlic is another must, and my favorite for early green garlic is Chinese Pink, because it is super-early and is eight inches tall and half an inch in diameter by mid-February if frost protection is used. Plant your early block with the cloves about three inches apart each way. When I’m ready for green garlic I pull alternate stalks, and leave the rest 6″ apart to mature for my earliest garlic bulb harvest. 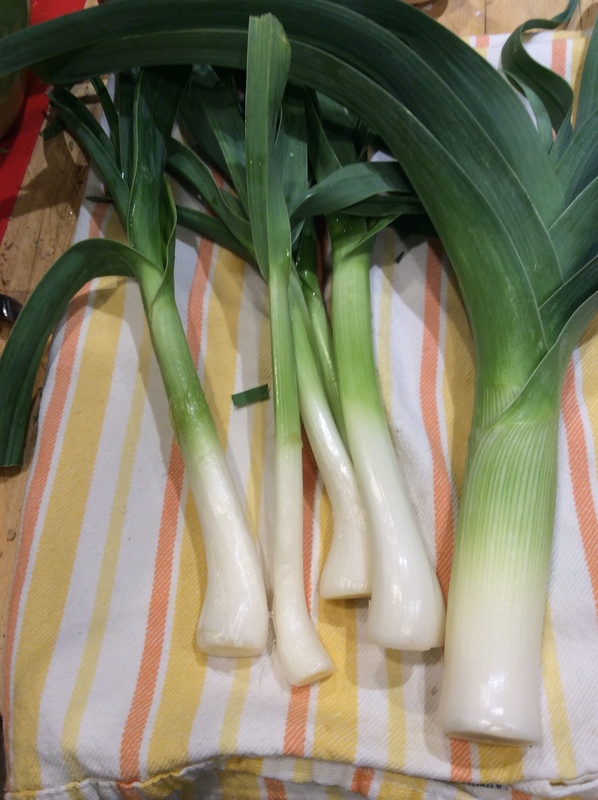 In the case of leeks, there isn’t even any need to replant in fall. Plant extra in spring, cover with frost blanket in late fall, and they will winter over nicely for February eating. Contrary to much popular advice, I don’t suggest that you even think about cutting the green leaves off and discarding them. They are delicious. They are also the healthiest part of the plant, full of the antioxidant allicin which has multiple health benefits. Do cut them in fine cross-sections, about a quarter inch long, to eliminate any possible stringiness in the leaves. I love a good assortment of green alliums chopped up and sautéed in butter with salt to taste until they are succulent and sweet. Keep the heat medium-low and let them cook at least twenty minutes for best flavor. I eat them as a side dish, but they would also be great on slices of crisp baguette, in an omelette, over scrambled eggs or rice, on a broiled fish fillet, or nearly any other way that you can imagine. Two years ago I stuck some garlic cloves in a flower bed planning to harvest them for green garlic, but forgot all about them in spring. After two growing seasons they’ve divided so much that the leaves are as fine as grass. I’ve started harvesting the tops and chopping them finely to use as a fresh seasoning. 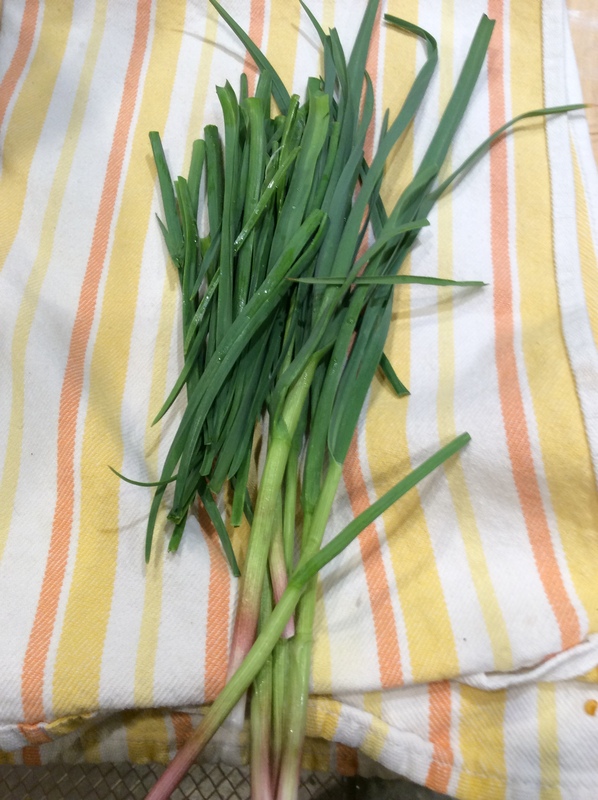 They have a stronger but cleaner flavor than garlic chives. I love them over egg salad, green salad, broiled or grilled meats, on soup, or anywhere that you might crave a hit of freshness and garlic. They give some distinction to a regular or low-carb pizza. 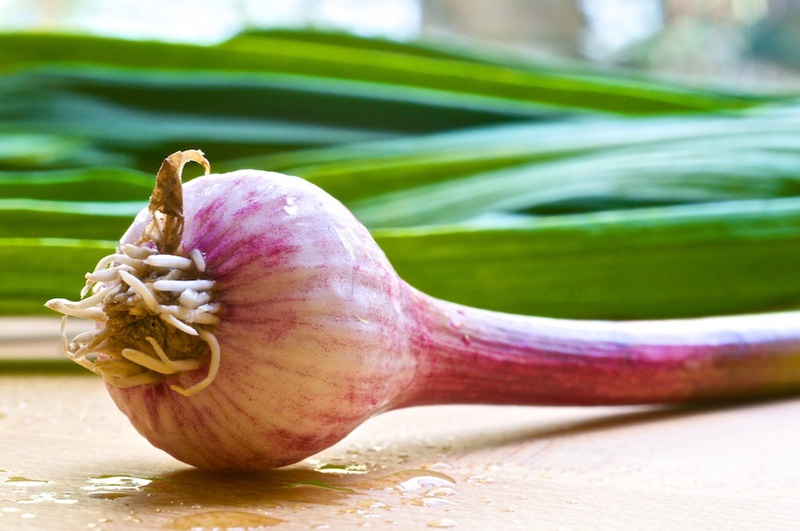 Garlic went through a period of being a fad health supplement for its allicin content. Allicin is an antioxidant to which miracles were ascribed at the time. Now that the fad is long over, maybe we can return to the subject in a more measured way, and eat some delicious food while we’re at it. There is relatively little allicin in mature culinary garlic, since it is found mostly in the skin. 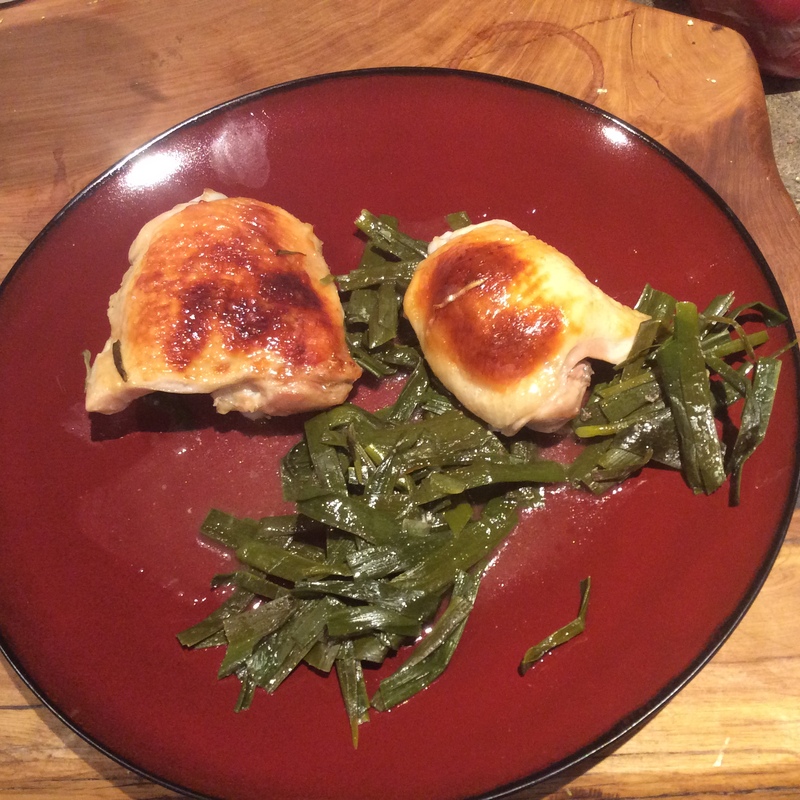 But there’s a way to eat a lot of it and enjoy it: eat green garlic, which is also a culinary delight. 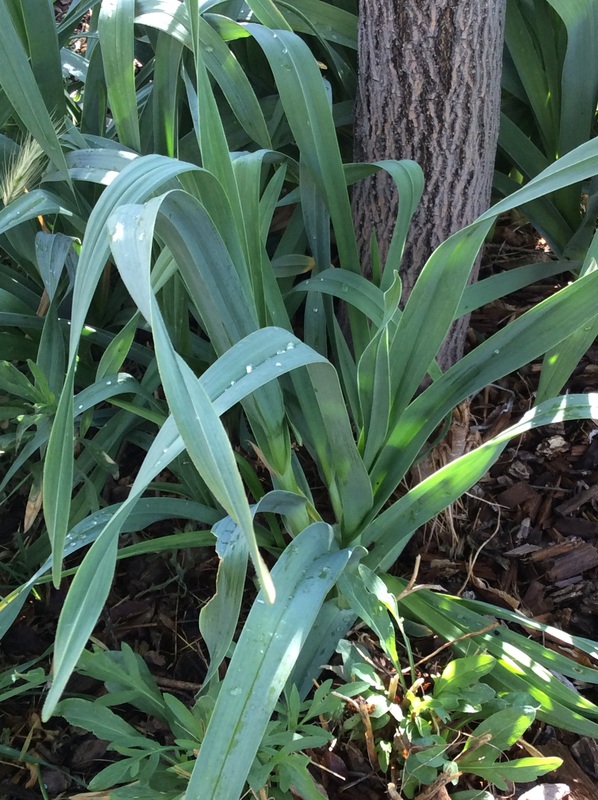 Garlic cloves are planted in early fall, and the greens shoot up in early spring. They vary in size according to variety. They are edible at any stage, from the tiny ramp-like beginning to nearly-mature but still soft-skinned bulbs as shown above. 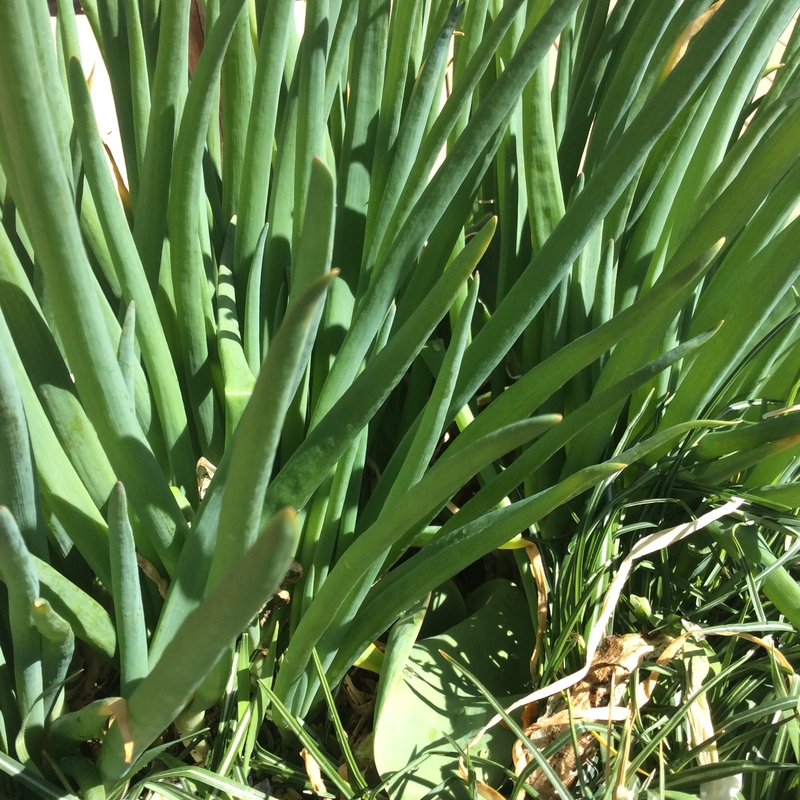 When the stem begins to thin and wither and the leaves look distinctly un-fresh, it is maturing and should be used as bulb garlic rather than green garlic. 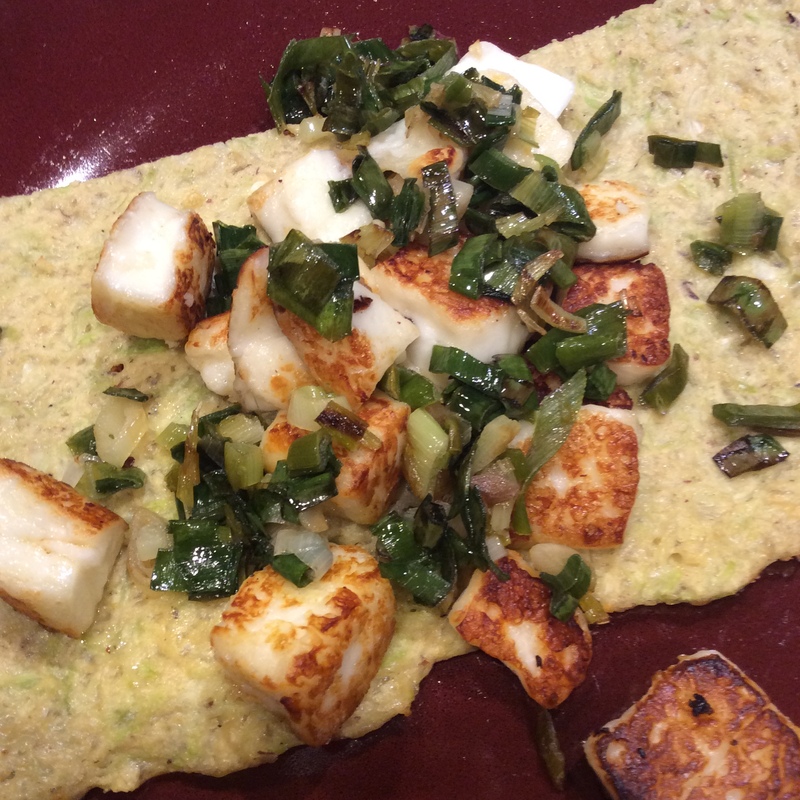 And here’s how to get your antioxidants in full: in the green garlic stages the whole plant is edible and tasty, and the leaves, shoot, and tender skin contain most of the allicin (reference below). 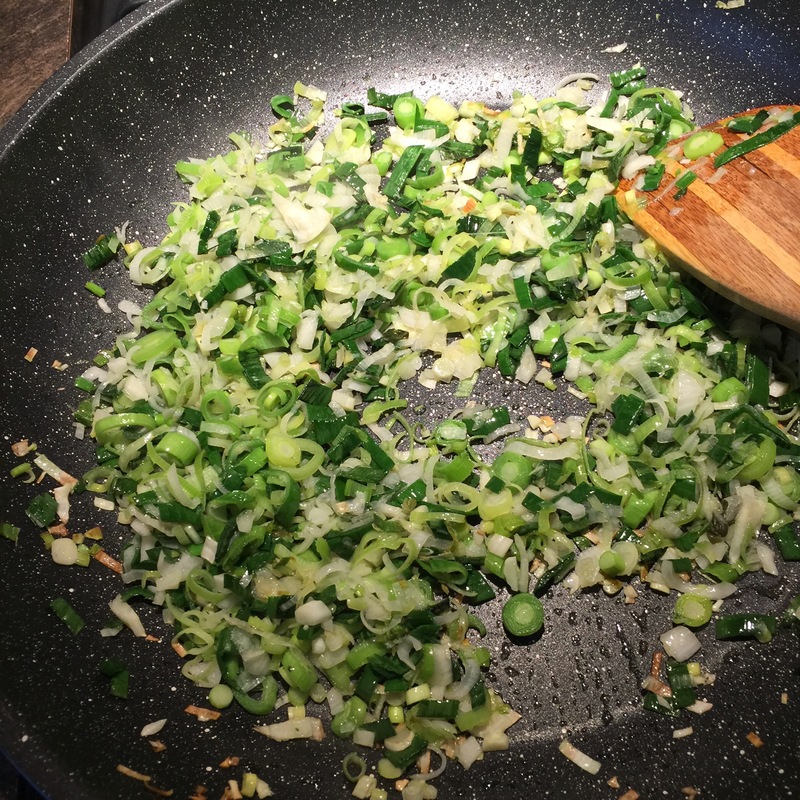 The leaves, stem, and skin( after the outermost layer is peeled off) all go into your sauté pan. Cut the root end off, trim the leaf tips, wash well, slice very thinly the whole length of the nascent bulb, shaft, and leaves, chop finely, and sauté in butter or olive oil with a good punch of salt until tender. Keep the heat medium to medium-low and plan to spend 15 minutes or so on the process, lowering heat as needed. It is done when it tastes rich, garlicky, mellow, and a little sweet. Do note that slicing it very thinly crosswise in the beginning is key to the shoot and leaves being pleasant to eat, since they contain strong lengthwise fiber. They can be used as the basis of any dish that includes garlic, unless the green color would be a problem, in which case just use the bulb and tender inner skin. 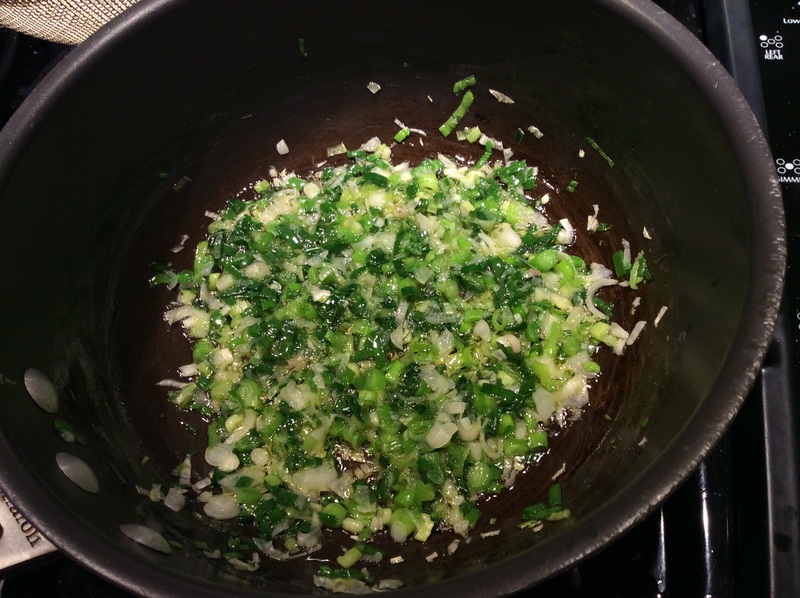 I also like the whole sautéed plant as a vegetable side dish when it comes from the milder varieties of garlic. If I am going to eat it by itself, I slice thinly crosswise but don’t chop the slices up, so there is some textural interest in the finished dish. Also, make sure to salt to taste during cooking, not when finished, so that the salt can penetrate. This is really good next to a lovely steak. Don’t forget that you can tuck a useful amount of green garlic into flowerbeds and at the bases of trees. Just don’t confuse it with daffodil foliage or other poisonous plants with similar long narrow leaves. If in any doubt, tear a leaf and sniff. Garlic leaves smell like garlic! I have heard that the leaves can also be dried, powdered, and used as a seasoning, but I’ve never tried it and don’t vouch for it. I go for fresh stuff.